The two most important and only elements in this type of problems is a BOAT and a STREAM. A stream is nothing but the moving water, which is sometimes also called CURRENT. In the question, by speed of the boat (or swimmer), we mean the speed of the boat (or swimmer) in still water. 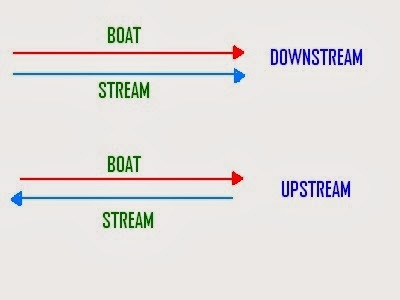 Upstream: When the boat (or swimmer) moves against i.e. in the opposite direction of the stream. Downstream: when the boat (or swimmer) moves in the same direction as that of the stream. Question: In still water, the speed of the boat is 7 km/hr. 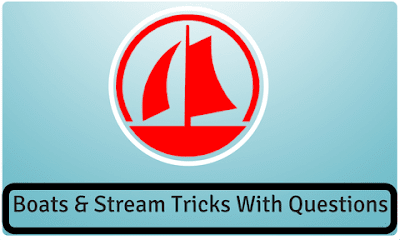 Find out the downstream speed of a boat in the river whose speed of the stream is 2 km/hr. 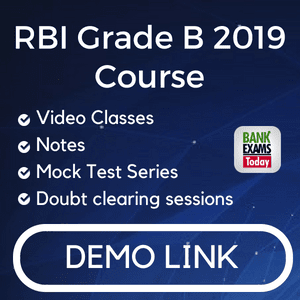 If the ratio of downstream and upstream speeds is D: U, then ratio of time taken will be U : D.
Question: A boat running upstream takes 8 hours 48 minutes to cover a certain distance, while it takes 4 hours to cover the same distance running downstream. What is the ratio between the speed of the boat and speed of the water current respectively? Now, as the ratio of time is inversely proportional to that of Upstream and Downstream speeds. Question: A boat’s speed in still water is 6 km/h while river is flowing with speed of 1.2 km/h and it takes 1 hour to row to a place and back. How far is the place? Question: Ramesh can row a certain distance downstream in 6 hrs and returns the same distance in 9 hrs. If the stream flows at the rate of 3 km/hr, find the speed of Ramesh in still water. 1. In still water speed of boat is 8 km/hr. Find the upstream speed of boat which is floating in the sea where speed of waves is 3 km/hr. 2. A boat covers a distance of 30 km in 3 hrs in the direction of stream and covers same distance in 5 hrs in opposite direction of the stream. Find speed of the boat in still water. 3. In still water, speed of boat is 10 km/hr. Speed of the stream is 4 km/hr. Therefore, in how much time will it cover a distance of 70 km downstream? 4. The speed of a boat in downstream is 24km/hr and speed of the stream is 8 km/hr. find the speed of the boat in still water. 5. The speed of a boat is 18 km/hr in upstream and the speed of the stream is 6 km/hr. find out the speed of the boat in downstream. 6. The speed of a man is 18 km/hr downstream and 10 km/hr upstream. Find out his speed in still water. 7. A man can row with 15 km/hr in still water and the speed of the stream is 13 km/hr. How much distance does he cover in 2 hrs during upstream? 8. The speed of a ship is 50 km/hr in downstream and 30 km/hr in upstream. How much time will it take to cover 280 km in still water? 9. The speed of a man in still water is 6 km/hr and the speed of the stream is 1.5 km/hr. A man rows to a place at a distance of 22.5 km and comes back to the starting point. Find the total time taken by him. 10. A man rows upstream 16 km and downstream 28 km taking 5 hours each time. Find the velocity of the current. 1. A man rows upstream 16 km and downstream 28 km taking 5 hours each time. Find the velocity of the current. 2. A motorboat takes 4 hours to travel a distance of 22 km downstream and it takes 8 hours to travel the same distance upstream. Find the difference between the speed of the boat in still water and that of the current. 3. A boat takes 3 hours to cover a certain distance when going with the stream and 5 hrs to return to the starting point. The rate of the flow of river is 5 km/hr. Find out the speed of the boat in still water. 4. A boat can go 15.2 km downstream in 24 minutes. If the speed of the stream is 2.5 km/hr. How much distance (in km) can the boat cover upstream in 18 minutes? 5. A boat can travel 4.2 km upstream in 14 minutes. If the ratio of the speed of the boat in still water to the speed of the stream is 7 : 1. How much time (in minutes) will the boat take to cover 17.6 km downstream? 6. If a man’s rate with the current is 12 km/hr and rate of the current is 1.5 km/hr. Find the rate of the man against the current? 7. A boat travels upstream from B to A and downstream from A to B in 3 hrs. If the speed of the boat in still water is 9 km/hr and the speed of the current is 3 km/hr, find the distance between A and B. 8. A can row a certain distance downstream in 6 hrs and return the same distance in 9 hrs. If the stream flows at the rate of km/hr, find how far he can row in an hour in still water. 9. A man can row 40 km upstream and 55 km downstream in 13 hrs. Also, he can row 30 km upstream and 44 km downstream in 10 hrs. Find the speed of the man in still water and the speed of the current. 10. A man can row km/hr in still water and he finds out that it takes him thrice as much time to row up than as to row down the same direction in river. The speed of the current is? These are the type of questions usually seen in the examinations. Try solving them using the formulas above and become a pro in no time. Let us know below in the comment section if you find difficulty in solving any of the questions here.